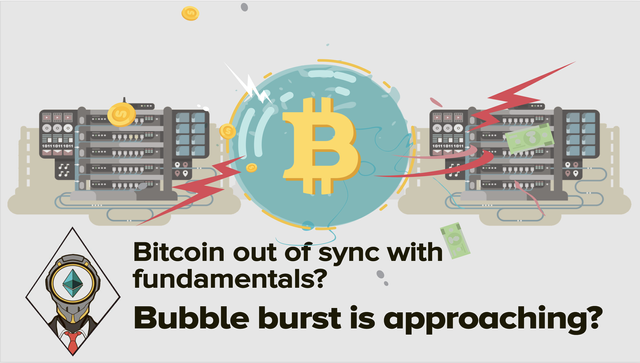 Bitcoin out of sync with fundamentals? / Bubble burst is approaching? Bitcoin has just passed the capitalization of IBM and now stands at $190bln. This is a very impressive and important number for Bitcoin and crypto community. With all this success, can we at least try to compare financial results with fundamental numbers? I am sure that every serious investor once in a while checks how many daily transactions Bitcoin has processed recently. Can we completely rely on daily transactions as the indicator of Bitcoin value? No. I will tell you the reason why on the next slide, but, having only daily transactions available, we should use it to try to compare how daily transactions’ growth kept up with the price growth. I think it will be interesting to see at least. What do you think can be Bitcoin fundamentals? For example, for Russian Federation, GDP per capita and governmental debt are fundamental numbers. For Alphabet (the owner of Google), net income and dividends per share are fundamental numbers. Well, I tried to summarize all the numbers that can be very important for the growth of Bitcoin on this slide. First is number of users. Actually, it is quite hard to measure but you can try to use a range of different indicators here. For example, you can take a look at blockchain.info where they show how many new bitcoin wallets were created, using their service. Since the beginning of 2017, the number of wallets doubled. Another good indicator is the number of unique addresses used on the Bitcoin blockchain. From the information available on the blockchain.info, the number of active unique addresses doubled or even tripled, it depends on what date you take as a reference. Unfortunately, this indicator is too volatile. Second thing is number of daily transactions. On the next slide, I will show you how I compared daily transactions with the Bitcoin price growth. It is extremely volatile indicator, so I used average of year 2016 and compared it to the 2017 results. Well, you’ll see. The third fundamental indicator is value absorption. It is really impossible to measure. Let me explain you why I think it is an important indicator. You see, if Bitcoin is to become the means of daily exchange, BTC will absorb valuation of fiat. If Bitcoin is to be recognized as a store of value, BTC will absorb the value of Gold. See where I am going? Other fundamentals. It includes news, trade volume, and other things. BTW, in my telegram channel I made a poll (t.me/cryptoportfolio/634) where I asked a question “What reflects fundamental value of Bitcoin the best?” What do you think was the result? 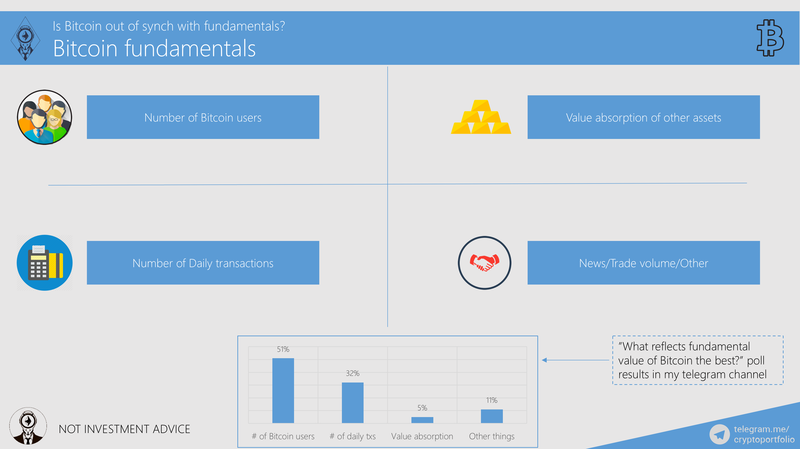 What Bitcoin fundamental indicator is recognized to be the best by my subscribers? Here are the results. Number of Bitcoin users is chosen to be the most important one with 51% of votes. Number of daily transactions takes second place with 32% of votes. Value absorption is 3rd with 5% of votes. Other fundamentals together got 11%. Finally. Here is the graph with Bitcoin price and daily transactions since the end of year 2015. From looking at it, I am sure that you already noticed that there was a correlation before the mid-summer of 2017 between price and daily transactions. Well, after July 2017 Bitcoin is out of sync with this fundamental indicator. What does that mean? First of all, I should mention that it is impossible to value Bitcoin with any indicator. Still, having limited range of available indicators is still good than having nothing. So, daily Bitcoin transactions is the only fundamental indicator we use here. I think that next time I could add something like daily active unique bitcoin wallets and new users on blockchain.info. I will save it for the next time. 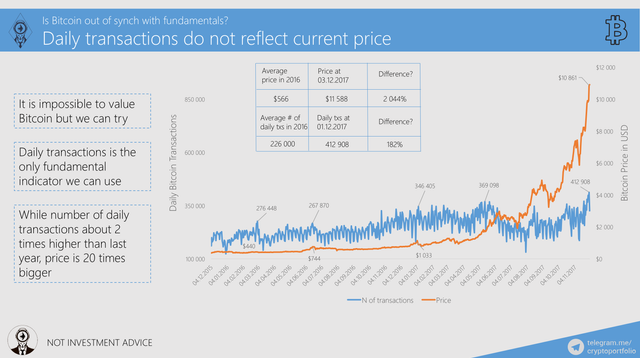 While number of daily transactions is about 2 times higher than last year, price is 20 times bigger. Average number of daily transactions in 2016 was 226 000, number of daily transactions at 1.12.2017 was 412 000. The difference is 182%. Average BTC price in 2016 was $566, price at 3.12.2017 was $11 588. The difference is 2 044%. What can we take out of this graph? I'm going to go with: Bitcoin is in bubble which is why it got out of sync with daily transactions.